At San Jose State University’s Annual Author and Artist Awards guests peruse some of the books published by Spartan faculty members in 2018. When they are not preparing the next generation of Silicon Valley students for momentous futures, San Jose State University’s faculty are researching some of the world’s most topical issues. 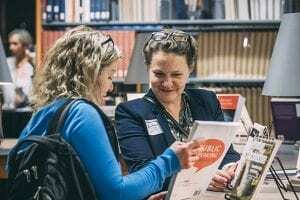 The published and performed work of more than two dozen San Jose State University faculty members were celebrated during a Nov. 2 ceremony at the Dr. Martin Luther King Jr. Library. More than 100 people turned up for the event to recognize the efforts involved in editing and authoring scholarly books on topics ranging from politics to 3-D printing to cybersecurity, creating celebrated theater stage design and writing an adaptation of an internationally acclaimed play. The seventh annual Author and Artist Awards presentation was held in the library’s spacious eighth-floor Grand Reading Room, where 29 pieces by 26 authors and artists were recognized. Of the 26 faculty members recognized, two honorees were asked to make extended presentations of their work. Associate Professor Virginia San Fratello, who teaches Interior Design, presented the book she co-authored entitled Printing Architecture: Innovative Recipes for 3D Printing. She noted it’s now possible to 3D print an entire structure. Taking advantage of the city of Oakland’s liberal review process for small residential units to help combat the housing crisis, San Fratello displayed such a home created by 3D-printed tiles. She showed striking photographs of more whimsical printed objects, too, including coffee cups and coffee pots made of coffee “flour,” sugar spoons spun out of the granulated sweet stuff, and saltshakers constructed of salt. “I approach these tasks like a chef in the kitchen,” she said. Matthew Spangler, an associate professor of Communication Studies, also shared information about his creative work. He first read the book The Kite Runner in 2005. The 2003 novel by Afghan-American author Khaled Hosseini detailed the tumultuous political and social events in his native country along with the exodus of refugees from Afghanistan to Pakistan and the United States — including the Bay Area. The book changed Spangler’s life. He wrote a stage play based on the novel, which was first presented by SJSU students in 2007. College deans introduced each of the other authors and artists, sharing a few notes about their scholarly and creative endeavors. See the list of all authors and artists on the library website.